Home » Genji Siraisi » The Meaning of Music & Entertainment in NYC (MOMENT NYC) – a journey through the musical history of New York City …is coming to PS110! The Meaning of Music & Entertainment in NYC (MOMENT NYC) – a journey through the musical history of New York City …is coming to PS110! There will be a presentation and live performance of some of the music that New York is famous for. Everyone is expected to sing along and maybe even dance a little! We live in a city where so much amazing music has been created. There is just no place in the world that has the kind of music history we have here in New York. Music from New York has reached and influenced every corner of the globe and is one of the defining characteristics of our city and it’s communities. The mission of MOMENT NYC is to celebrate and support through education and performance the diversity and heritage of musical communities throughout New York City. Our goal is to bring the incredibly rich history of music in New York to schools throughout the City in the form of presentations, performances and events, to preserve this history and inspire future generations. Additionally, we are creating an educational website as a teaching resource available to all. 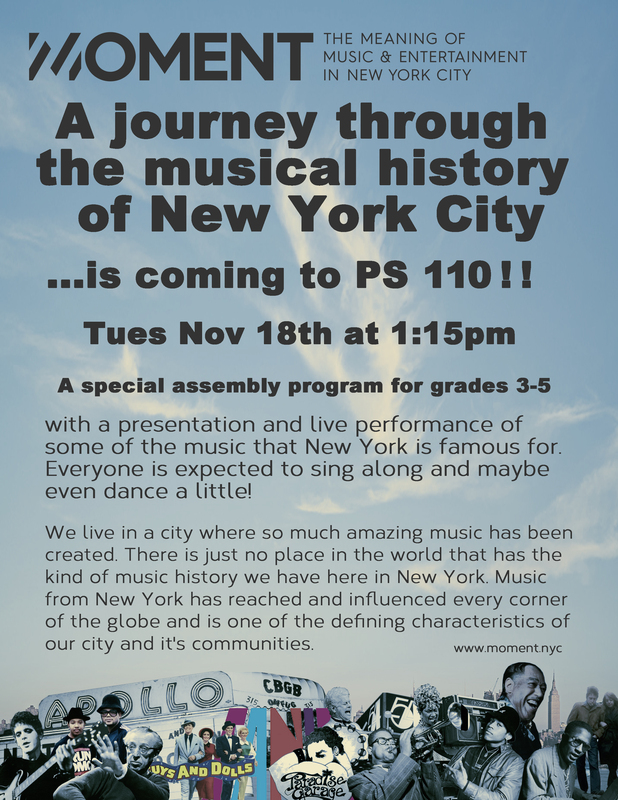 The first program we are bringing to PS110 is an introduction to some of the major musical contributions created in New York. It will include a live performance geared toward interactive participation with the students. Subsequent editions of the program will cover the entire history of music and musical entertainment in New York City, from the Lenape Indians to Tin Pan Ally, Be Bop and Broadway. From Salsa and Punk Rock to Hip Hop and Opera. From the Brill Building, The Apollo and Lincoln Center to Folk music, the present day and everything in between. The curriculum will be broken into four age-appropriate program levels. Community pride, participation, musical education, local history, exposure to the arts, social studies, collaboration, creative process, social interaction. A special thanks goes out to: Karen Feuer, PS110, Eyeball, Jun Oshima and The New School, Alice Arnold and all the musicians, parents and local merchants that have made this possible. We thanks you for your continued support! ← Nublu celebrating 12 years of scene!